Eva Funderburgh spent most of her early life in Kansas, watching cartoons, playing video games, reading comic books, running around outside, and occasionally playing with craft supplies. When she wasn’t doing that, she was planning growing up and being a marine biologist so she could save the sea turtles. In high school, she moved to Pittsburgh. While she’d often dabbled in clay before, it was at this point that she started to think about the possibly of art as a career. She was lucky enought to be a part of the Manchester Craftsman Guild after-school program, one of the best ceramics programs in the country. She also spent a summer at the Pennsylvania Governor’s School for the Arts, a summer program for talented high school students from across the state. She went on to Carnegie Mellon University, studying chemistry and sculpture in a new interdisciplinary program. She also spent a semester studying sculpture at Nagoya Zokei University in Japan, an experience that helped shape her work as well as her approach to life. 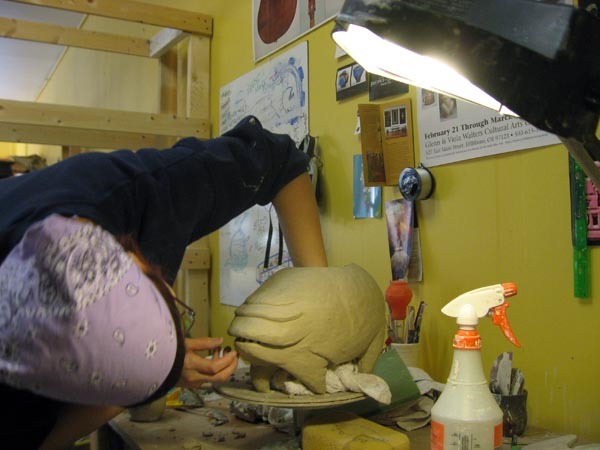 At the end of college career, she began focusing once again on the world of ceramics through independent study work, along with internships in wood firing and at Standard Ceramics Supply. After college, Eva moved to Seattle with her boyfriend, who she later married. She served as an assistant to woodfire potter Steve Sauer for a year, before helping found Florentia Clayworks, a small co-op studio along with Susie Scheiber, Lin Holley, Randolph Sill, Suzy Jennings, and John Ellefson. She regularly helps fire Santatsugama, an anagama in Seabeck, WA, along with any other kiln she can help out at. Eva’s work focuses on emotion and whimsy. It exists in the middle ground between cute and creepy, cuddly and sinister. In her sculptures, you can spot influences ranging from the tea ceremony to video games. She’s attracted to woodfire, finding it to be a symbiotic method finishing her pieces, allowing the kiln to play a significant role in her finished work. However, she’s always experimenting with new forms and new methods.